A head-on collision of two Sikkim vehicles killed one on the spot this afternoon. The head-on collision occurred between Gelkhola and Likuver under Tista check post on NH 10. The collision was between a pick up van going towards Malli Sikkim and a Truck headed for Siliguri from Singtam Sikkim. from the right side and overturned. Luckily it only broke some barrier and not fall into the river.A total of three persons, along with the driver, were in the truck in which Rajen Bhatrai (29) of Salugara, Siliguri,who was sitting on the left side of the truck was declared bought dead by Tista PHC. The driver and one other escaped with minor injury and have been admitted at Kalimpong Hospital. Meanwhile the pickup truck driver,Bikram Thapa, who was traveling with his mother and a kid have also sustained injuries and are admitted at Kalimpong Hospital. Both the drivers have been blaming each other,said the police. 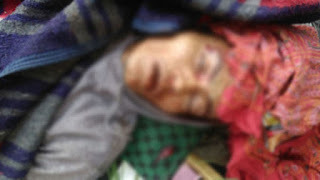 The body of the deceased has been sent to Kalimpong Hospital for post mortem . 0 Respones to "One dies in vehicle collision on NH 10"